Over Memorial Day weekend I had the guilty pleasure of consuming alcohol, food, and culture in a gluttonous fashion in the city of regret and hangovers - Las Vegas. While I will not break the cardinal rule of “What happens in Vegas, stays in Vegas” and fill you in on my adventures I must, however, share my night with Incubus at the Hard Rock Hotel’s The Joint. Having become an avid fan, circa 1999, I’ve since developed an obsession (sometimes rather sickly) for these talented musicians/artists. But, having enjoyed success for over a decade, I have been joined by millions of other fans in my “sick obsessions.” My partners in crime, who drooled in unison over the two hour set last Saturday night, experienced a continuing drunken euphoria as time slowly ticked by melody after melody. Opening with one of my all-time favorites, “Privilege,” (from the Morning View album) set a reminiscent upbeat feeling for the show. Other favorites—such as “Megalomaniac,” “Drive,” “Wish You Were Here,” and “Stellar”–were tied into newer hits off of the If Not Now When CD. “If Not Now When” (ridiculously good if you ask me), “Switchblade,” “In the Company of Wolves,” and the more dedicated fans favorites like “11 AM,” “Earth to Bella Part 1&2,” “Sick Sad Little World,” and “Certain Shade of Green” all helped make the night even more mesmerizing. It’s good to see musicians who stay true to their style but adapt to the progression of their musical abilities. Incubus has been able to do just this while continuing to grow their fan base. A good example was the performance of” Sick Sad Little World.” The track itself ranges from 6 minutes 30 seconds in length to double that in a live setting, which provides the perfect opportunity for guitarist Michael Einziger, DJ Chris Kilmore, bassist Ben Kenny, drummer Jose Pasillas and the legendary front man himself, Brandon Boyd, to let loose and jam however they feel like it. Over the years fans have had an idea of what to expect during this amendable part, but this year it was more hard rock and distortion in its fullest maturity making it by far the best live performance of this song ever. 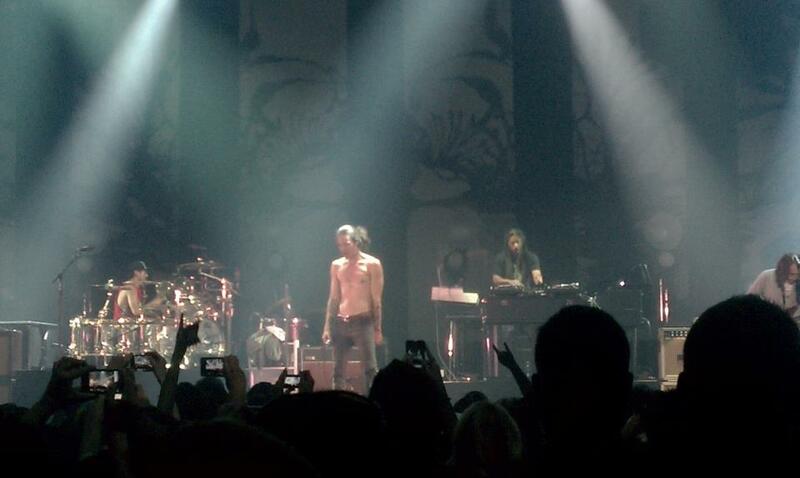 While I might be extremely biased by deeming this the best Incubus concert to date, I’d like to know from our devoted readers: have you ever experienced a live show that was life changing? If so, who was it and why was it? Post your answers below. Till then, I’ll be here drooling over the YouTube videos of Incubus live at The Joint from the night of May 26, 2012.